An apple a day keeps the doctor away. 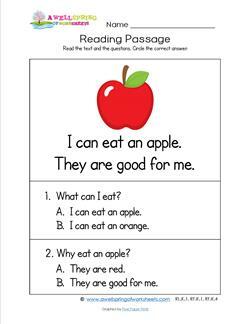 At least that's the message this kindergarten reading passage is pointing out. Cute bunnies come and cute bunnies go. Hope this kindergarten reading passage doesn't slip away, too. 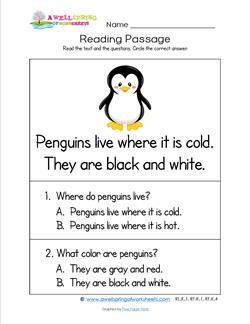 Kids read & answer 2 questions. This might be one of the boy's favorites of these kindergarten reading passages! Two sentences and two questions. 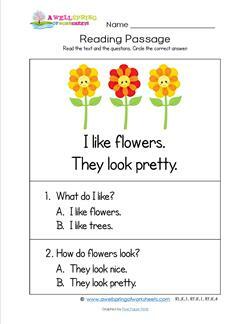 This set of kindergarten reading passages wouldn't be complete without some flowers! Two questions included. 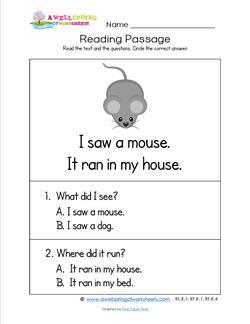 These kindergarten reading passages have quite a number of animals on them, but none is as ready to take a leap as this one! 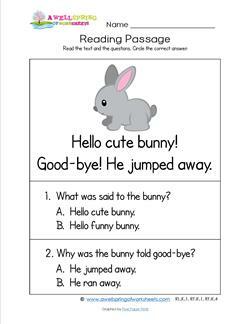 Kindergarten reading passages should relate to kids. 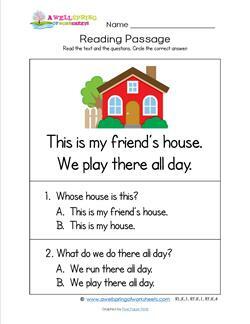 Kids can read this one, answer the questions, and tell whose house they go to. 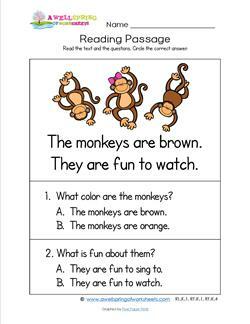 Kindergarten reading passages have to be fun to keep kids engaged. Have kids make all kinds of monkey noises! 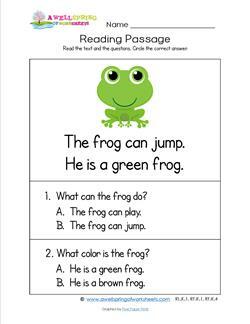 Of all of these kindergarten reading passages, none may stir as much excitement as this one! A mouse in the house! EEEkkkk! Ahhh, the wonders of nature. Finding a nest with real live eggs! 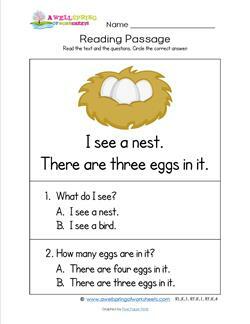 Kids read the passage, count the eggs & answer the questions. 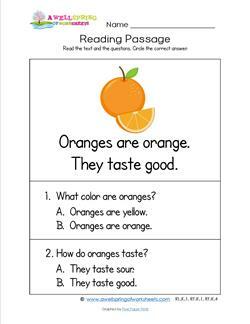 Kindergarten reading passages should also have some astounding facts like "Oranges are orange." Ha, ha! Everybody loves these waddling friends! 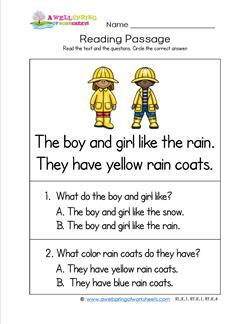 So here they are in these kindergarten reading passages. 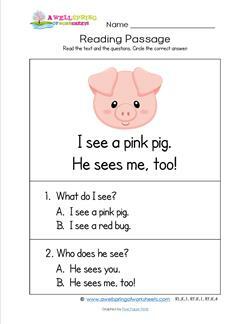 A little akin to peek-a-boo, this kindergarten reading passage is about who sees who without the actual "Peek-a-Boo!" Rain, rain, go away! But why should it when you're decked out and ready for some drops from above? 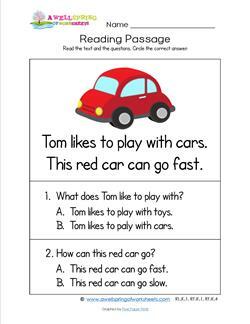 Read then answer the questions. Remember the tortoise and the hare? 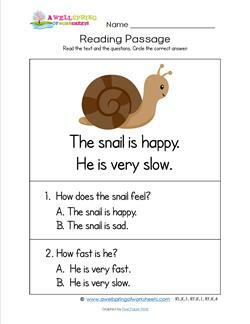 Well, I think this slow snail in this kindergarten reading passage could be a winner, too! 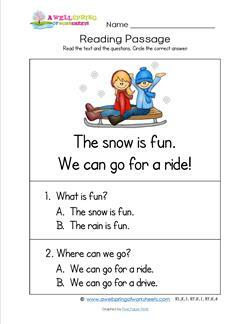 Here's a winter kindergarten reading passage for you! Wherever there's snow kids are sure to make the fun happen. When kids are given reading passages they have to have one about bugs. It's just a must. 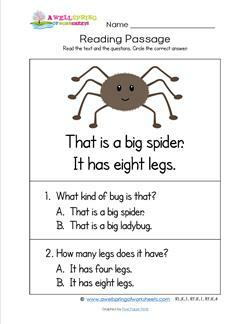 How many legs do spiders have? 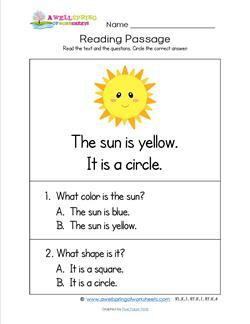 This kindergarten reading passage would be great for a science unit, or a shape lesson ... or a color lesson. Enjoy! 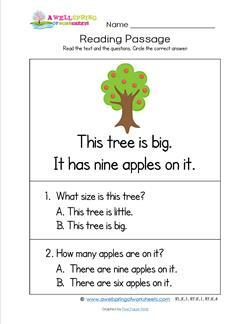 In this reading passage you don't need to count how many apples up on top, you need to count how many apples in the tree.